By the beginning of the nineteenth century Palmer’s almshouses were falling into a serious state of disrepair. Moreover, no schoolchildren had been taught since 1728. In 1817 the buildings were extensively rebuilt and a new schoolmaster, James Thomas, was appointed. As well as teaching the 20 boys funded by the Palmer trust he had to teach 20 boys from the Emery Hill foundation. Additional funding was allocated to provide clothing for the children. Each year they would receive a jacket and trousers, a shirt and band, a pair of stockings, a cap, a handkerchief, and a pair of gloves, and once every four years they would receive a gown to be worn on public occasions. The governors were concerned about what would happen to the boys when they reached school leaving age. Another development in 1817 was that the trust began to pay the 5s fee required by boys who went into an apprenticeship. Each almshouse consisted of one room, divided into two sections. They were occupied by six men and six women, at least 60 years old. From 1817 they received £1 10s a month, and every three years the men were given a cloak and the women a gown. They also received 5s for a Christmas dinner and 5s on St James’s day. There was an annual allowance of 20 chaldrons of coal to be divided between the residents and the schoolmaster. The endowment by James Palmer included two pieces of land intended to generate income that would be used to maintain the school and almshouses. One of these was an estate in Berkshire called Ashamstead Farm. The other comprised six acres of Tothill Fields immediately to the south west of the almshouses. It was this area that became known as Palmer’s Village. As far as I know no records survive of the development of Palmer’s Village. I am happy to follow Charles Manby Smith and simply imagine with the mind’s eye the gradual dotting of the greensward with the homes of the labouring poor until the straggling group of dwellings had clustered by degrees into something like a hamlet. It had no formal streets, but instead rows of houses, mainly single storey cottages, arranged in an irregular fashion. People who lived there often gave their address as just Palmer’s Village, though when necessary they would add the name of the row of houses that included their home. Paradise Row, perhaps, or Fisher’s Buildings. Even at the date recalled by Manby Smith the village still retained many of its rural charms. Above all it had a village green. A May-pole would appear at dawn on the first of May, and the lads and lasses of the village would dance around it. There were gardens in which vegetables mingled with hollyhocks, polyanthus, bloody-warrior, cabbage rose, marigolds, and sun-flowers. Some of the residents kept chicken, ducks, and livestock. The pigs tended to stray beyond the boundaries of the village. They knew the map of Westminster as well as any postman. There was an old-fashioned way-side inn, the Prince of Orange, run by Mr and Mrs Wiggins. Mrs Wiggins served behind the bar, and no one ever saw more than her head and shoulders. The inn stood a few feet back from the road. It had a sign with the portrait of the Protestant Prince on either side, and below the sign there was a horse trough always full of pellucid water. Next to the inn was the village shop. 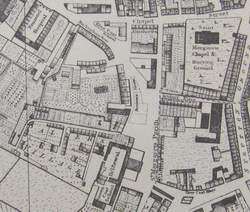 It stocked a variety of merchandise that meant it did the work of Cheapside, Holborn, and the Strand all under one roof. Elsewhere in the village there was a baker, a butcher, a tailor, and a dress-maker, Mrs Gandy. Mrs Gandy had never married, but the matrimonial appellative was due to her mature appearance and perhaps, who knows?, was a balm to her feelings. The village barber plied his trade mainly on Saturdays. He spent the rest of his time in strop-making, travelling around London every Monday to sell his wares. Manby Smith devotes a long paragraph to the work of the blacksmith, who was also a capable musician. On a Sunday afternoon you could hear him hammering out on a set of hanging bells the psalm tunes he had heard at Westminster Abbey that morning. There were close links with Westminster Hospital, which in those days was located next to Lady Dacre’s almshouses. Village residents would go there for treatment, and former patients of the hospital would sometimes take temporary lodgings in Palmer’s Village during their convalescence. For Wiggins, the landlord of the Prince of Orange, the hospital was a major source of income. At dinner time and supper time he could be seen wheeling a monstrous travelling-can to the door of the hospital. The can contained the beer prescribed for the patients by the medical men and an allotted amount for the household staff. Research by John Hills means we may have to be a little careful about accepting some of the account given by Charles Manby Smith. It seems that Manby Smith did not live in Palmer’s Village for several years as he claimed. It is possible that he lived there only for a period of months in 1833. Charles Manby Smith does not mention any schools in the village. We will see in a moment that in the 1840s only a small proportion of children in Palmer’s Village attended school, but from the observations of the French social reformer Flora Tristan we know that in 1839 the village had a nursery school. On her visit to the school Flora Tristan passed through a room containing about a dozen very young children, and then into a larger room in which 52 children aged three to six were being taught. The smell in that room was so unbearable that Flora Tristan was obliged to leave and continue her observations from the courtyard. She discovered that several subjects were taught in the school, with special emphasis on arithmetic. Most of the funding for the school came from a charitable foundation, but fees of one penny a week per child were charged, an amount that was often beyond the means of families that had several children. Flora Tristan recorded her observations in Promenades dans Londres, available online as a Google book. Send me an e-mail if you would like a copy of an excellent English translation by John Hills of the section on Palmer’s Village. Part of Horwood’s map, published in 1813. Palmer’s almshouses are those running north to south on the west side of St Margaret’s burial ground. In the area designated as Palmer’s Village you can just make out the name of one row of houses, Fulmer’s Row.